The phrase “Internet of Things” (IoT) is currently echoing around the workplace, becoming an increasingly popular vertical for innovation efforts. Although the term is cute and simple to say, the application of it can be complicated to grasp. From city planning to the realm of retail, IoT is being implemented all around us, so it is important to understand what it is, how it works, and what is reality versus hype, as well as what role it might play in your future. Imagine every device that is part of our daily lives (e.g., light bulbs, coffee makers, car engines, computer screens, headphones, toilets). All of these devices, if connected to the internet, can be a part of the IoT. Actors like people, nature, and buildings then communicate to these things, passing on information by simply using or being near them, and these things connect to other things by sending information to one another, sometimes directly and sometimes through the cloud. Imagine turning on your coffee machine. The information collected indicates you are getting ready to leave your house for work. Now, imagine if that information was automatically sent to your car engine outside as an indicator to turn the car on. It also talks to your alarm and notes the lag time between your last snooze button, the length of your shower, and how long it took before you poured your first cup of coffee. One company, Nest, is currently designing “smart home” devices to simplify and automate tasks inside homes. Their door locks, smoke alarms, doorbells, and more can connect to one another and to smartphones for coordination and analysis. On a larger scale, cities are implementing this type of technology to automate the exchange of important information. One example of implementation is the use of smart lighting in street lights. When one light goes out, it can communicate to the nearest light to brighten until the first one is fixed. 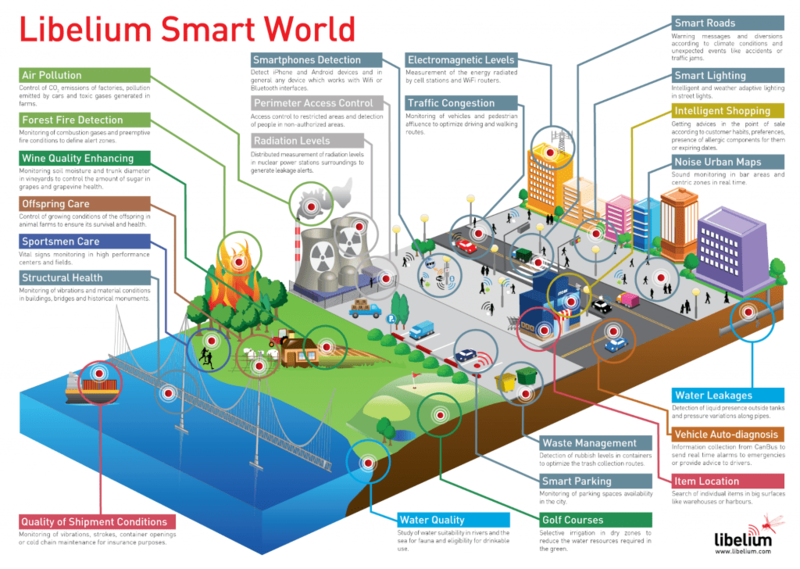 Some more “smart city” examples can be seen in this diagram created by Libelium. It is important to note how powerful these devices are when they’re working together and communicating with one another. IoT will be responsible for some of the most significant solutions witnessed by this generation. Of course, data are useful, until there is so much data that anything useful becomes buried in piles of unused data. Right now, all 20 billion (some forecast 200 billion by 2020) devices are collecting data, and all of that data are fed into the IoT. With so much data being collected, the space is full of unimportant, useless information. Where are all of these data? All the data need to be stored somewhere, and that “somewhere” is another fun buzzword—the “cloud.” IoT data are kept somewhere between the device where the data were collected and the cloud, which is where things start to get fuzzy. A majority of the data are kept in the cloud, but some are in-between the two digital storage spaces. Now you may ask yourself, wait, what? There’s a space between the cloud and the device? Yes, it’s called the “Edge,” and it aims to process data as close to the device as possible. This allows for quicker analytics and response time for devices and is valuable to devices that need to process information instantly, such as smoke detectors, medical devices, or even the water quality detector previously mentioned in the Libelium figure. Additionally, it keeps useless data from going into the cloud, where storage costs money. Alright, so how does that apply to retail? Data are extraordinarily valuable to anyone attempting to learn more about a system, and the retail sector is one of the biggest systems people interact with every day. The IoT has the potential to improve the consumer experience in stores, online, and everywhere in between and improve sales and reduce losses for brands and retailers. The IoT is already implemented in many retail spaces, such as the Starbucks Beacon technology, Sprucebot digital assistant, supply chain logistics, the Amazon Go store, and more. However, this revolutionary shift into the world of data is only beginning. The real value is the interconnectivity of these devices—a phrase that is never too far from an IoT conversation. With these devices’ interacting and reacting according to the information that is presented to them (consumer behavior), they become extremely powerful. Who’s actually doing this right now? 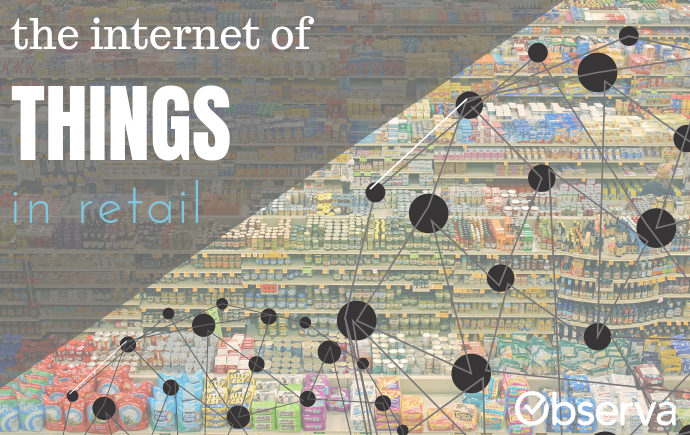 Seventy percent of retailers are planning on integrating IoT in the next three years. The era of IoT is here, and retailers and brands will need to adopt this technology to stay competitive. 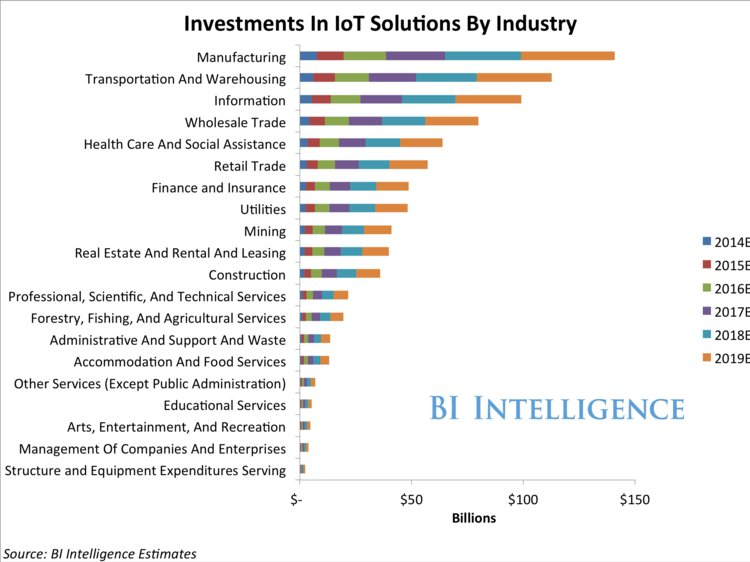 The majority of recent IoT investment is going toward manufacturing, transportation, warehousing, wholesale, and retail. 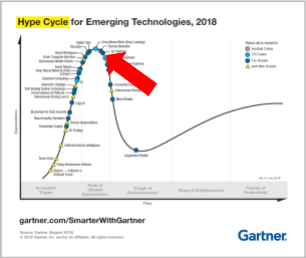 One interesting note to include is the placement of IoT technology on the Gartner Hype Cycle from 2017 to 2018. In 2017, it was placed in the beginning of the “peak of inflated expectations.” This aligns with the recent media exposure around its far-reaching potential. 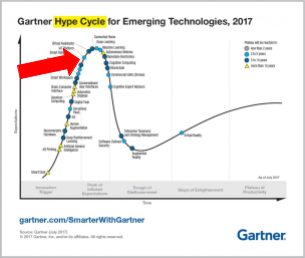 Yet, as we move through 2018, it is falling into the “trough of disillusionment,” where many implementations are expected to fail, and the excitement will dwindle. It is thus necessary to mention this with the above-mentioned potential ideas because even though there is excitement, there are also expectations that some of the IoT executions will fail. Observa is involved with all of this? There is a lot of talk about how machines are great; however, they have their limits. Much of the current disillusionment around IoT comes from the disconnect between humans and devices. Right now, the technology of these devices, or “things,” can only accomplish so much on their own, and their true potential comes from pairing them with human ability. Humans can analyze information to create insights and ideas that are more connected to reality than computers can. Machines can detect anomalies in data much quicker than humans, but in many cases that is all computers can do. Humans are needed to investigate these anomalies, which is where services like Observa can help because it utilizes a hybrid intelligence approach where machines and humans are paired to discover and diagnose issues quickly. Observa’s network can respond in real time to any requests that arise. If a machine detects something is wrong but doesn’t have information on what is wrong, a human can be sent in to figure it out and reset expectations or make adjustments. The Observa platform joins the IoT to notify humans when a device has an exception that needs to be checked. If it’s a complicated issue, such as a solar panel not working, a high-priced technician may be notified to check on the physical issues. However, an easy checkup may only require one of the nationwide Observa app users to take photos at the location. This exception-based form of reporting is an efficient way to bridge the gap between device and human communication, and it will be used in IoT solutions that make it past the trough of disillusionment.